The Streeterville Luxury Townhome was also featured on NBC's LXTV Open House where Deb discusses how she achieved luxury in this bachelor pad while still maintaining a pet-friendly environment. “Deborah was awarded 1st place—Residential under 3,000 sqft—at the 2007 ASID Design Excellence Awards Competition." - ASID Inside Illinois. DRIDGI's publication in the ASID Illinois discussing the Chicago Luxury Condo can be found here. Deb Reinhart Interior Design Group was featured in Modern Luxury Interiors Chicago for their work on the Streeterville Luxury Townhome by beautifully incorporating the client's personal artifacts and possessions into the design of the home. The Chicago Luxury Condo project was also feature on Chicago Social Magazine. Download the full article here for more insider designer tips. 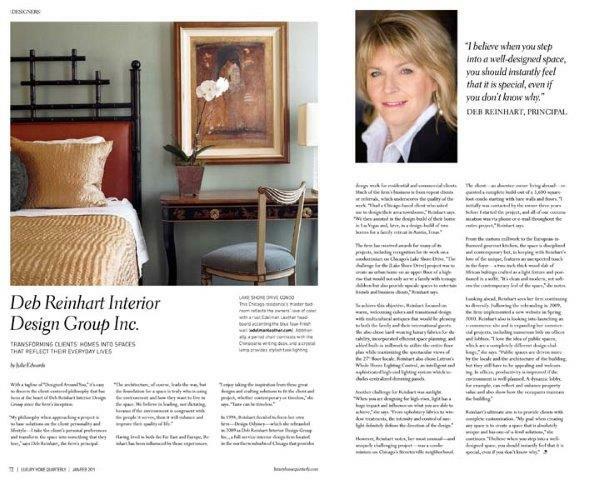 Most recently, Deb Reinhart Interior Design Group was featured in Splash Magazine, one of Chicago's leading magazine publications in trending style and design. Read about her Lake Forest Coach House Project. TCW featured Deb Reinhart's City Beach House as a Urban Retreat. “In less able hands, bright colors such as the ones in this room by Deb Reinhart (debreinhart.com) might seem childish. But when combined in sophisticated accents, fuchsia, turquoise, and lime evoke just the right sense of fun. Maintaining a roughly equal representation of each member of this trio is key to pulling it off.” Read more on Deb's Lake Forest Coach House project featured in Chicago's Home and Garden by downloading the PDF article. DRIDGI made their way onto the a Premiere Issue of Real Kitchens for the Streeterville Contemporary Condo kitchen renovation. 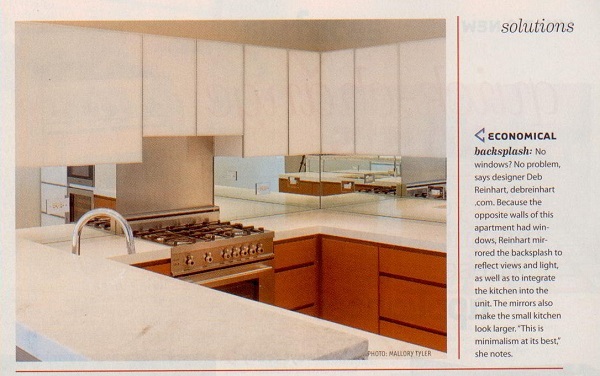 The article highlights her use of mirrors as a backsplash. Deb chose the mirrored backsplash both to help create the illusion of space in a smaller kitchen and to have a contemporary look in this modern space. “With a tag line of ‘Designed Around You,’ it’s easy to discern the client-centered philosophy that has been at the heart of Deb Reinhart Interior Design Group, Inc. since the firms inception.” Get the full scoop on the Chicago Luxury Condo project by downloading the article. Deb Reinhart was honored to be highlighted in A.S.I.D magazine.